The Orfeó Català is made up of some eighty singers and can be expanded up to a hundred and twenty for large-scale productions. Its members' dedication to the Orfeó is entirely vocational. All of them have passed an entrance test in which they proved themselves to have the right level of musical training and, above all, good vocal conditions. The choristers work in a range of fields, including education, medicine, arts administration, banking, different official bodies, the business world and music itself, among others. The rhythm of work of the choir is based on a routine of two rehearsals a week, which are held at the Palau de la Música Catalana. 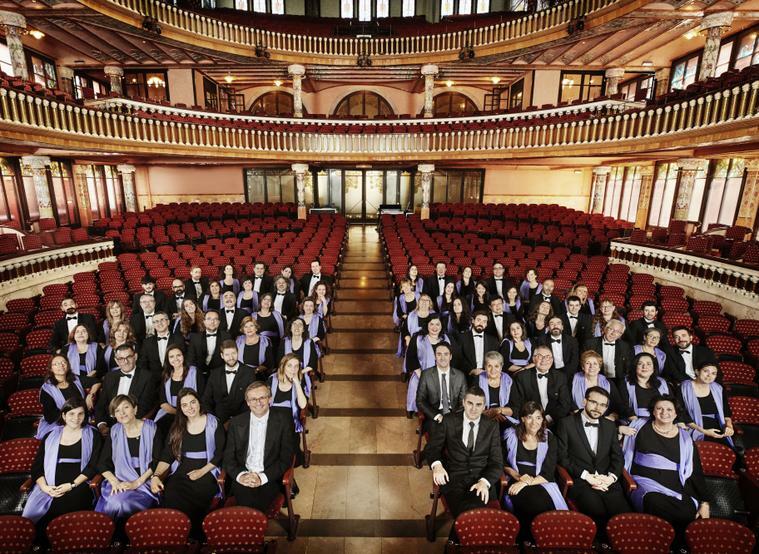 The choir performs twenty-one concerts a season at the Palau itself and at different venues in Catalonia and elsewhere. The vast majority of the Orfeó's activities take place on days and at times outside the singers' working hours, but certain projects occasionally require them to be able to miss work for a few days. Choir rehearsals will take place at the Palau de la Música Catalana on Tuesdays and Thursdays, from 8.30 pm to 10.30 pm, from September to July. Eventually, on the eve of the concert, there will be rehearsals with orchestra on other days and times, which are announced in due time. The schedule of the course will be provided once the singer has passed the entrance test. The Orfeó Català provides its singers vocal and musical training staff quality and custom. A professional teaching team assumes the formation of the singers, under the supervision of the director and artistic team. The teachers team is composed of Marta Mathies Xavier Sans, Margarida Lladó Glòria Coma, Elisenda Arquimbau, Daniel Morales and Oriol Rosés. The Orfeó Català has a season lasting 11 months a year. Its musical activities are organised around the concerts it gives in the different series at the Palau de la Música Catalana, those for which it is hired by other auditoria, its tours in Spain and elsewhere, a cappella concerts in towns around the country, the traditional Sant Esteve concert at the Palau and other one-off concerts. In the coming 2016-2017 season, the Orfeó Català will perform, among others, the following works: The Mass of Requiem by G. Verdi, G. Fauré's Requiem, Chichester Psalms by L. Bernstein, Cantata Randa by S. Brotons, M. Duruflé's Requiem and the 9th symphony by L.V. Beethoven. The orchestras that collaborate with the Orfeó Català will be the London Symphony Orchestra, the Symphony Orchestra of the Balearic Islands, the Simon Bolivar Symphony Orchestra and the Orquesta Sinfónica de Barcelona y Nacional de Cataluña. Among the directors who directed the choir include Gianandrea Noseda, Salvador Brotons, Gustavo Dudamel and Kazushi Ono. The concerts will take place at the Palau de la Música Catalana, at the Auditori of Barcelona and Palma de Mallorca.